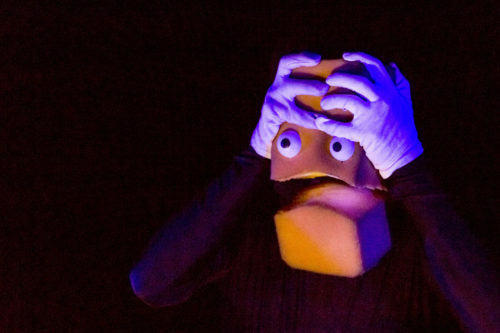 This year, The Last Great Hunt's 2015 sell-out hit Bruce, a puppetry adventure through space and time, detailing the life of a puppet made of sponge, returns to the Fringe, playing once more to packed houses. Its popularity is undeniable. Bruce himself, an affable, likeable but misfortune-prone man, is brought to life expertly by Wyatt Nixon-Lloyd and Tim Watts, clad in black morph suits - one of whom provides all of Bruce's gestures with white gloved hands, the other the voices of Bruce and several other characters. So far, so good. It's a clever idea, and its Blue Peter-ish sponge central character should make for a show full of typical fringe chutzpah. Sadly, however, the main problem with this comedy show is that it simply isn't funny. While comedy may be the most subjective of all the art forms, it speaks volumes that at the performance I attended, gag after gag failed to land. There were hushed titters here and there for much of the show. Several punchlines are repeated with a slight twist to reinforce the joke, in the manner of a tired American sitcom. The story begins to drag as it seems to start becoming an hour in search of a big laugh. Aside from a few great observational moments and more interesting chatacters - Bruce's lady interest who insists on ordering entire bottles of wine at restaurants and who would rather have an entire cow than a steak springs to mind - the show's forced nature cannot be avoided as the 60 minutes continue. There is no doubting the considerable talent of the two puppeteers, but an exemplary understanding of one's craft does not necessarily a great hour of narrative comedy make. A crying shame. With considerable rewrites and tightening of the material and the story, this could be an absolute joy.